On one hand, routines are a pattern of comfort and repetition. Humans survive on them because they create efficiency and accuracy, generally reducing the effort required. At the same time, routines can be negative behaviours. They keep us from experiencing new things, seeing new opportunities, and in many cases, changing our lives long after we should. Routines can easily stifle our creativity. The trick is finding the balance that allow routines to shape the day but not limit learning, discovery and advancement. Mason Currey researched the daily patterns of 161 creative people to better understand how the artist worked. 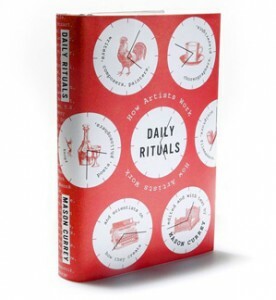 In his book Daily Rituals, Currey recounts the routined life of Honore de Balzac (who drank 50 cups of coffee each day), Maya Angelou (who could only write in hotel rooms), George Balanchine (who preferred to do his own ironing, and came up with much of his choreography while ironing). Recently, Info We Trust took Currey’s intelligence and created a fascinating poster of some of the artists. You can see the poster in its large size here. While Currey’s research can be fascinating, you’ll hardly become more creative simply by recreating someone’s else “creative routine.” But, there are some interesting considerations for us Ludwig van Borings. Do you know how and when you’re most creative? And if you do, do you organise your day around that creative time to allow your imagination to work at its full potential? 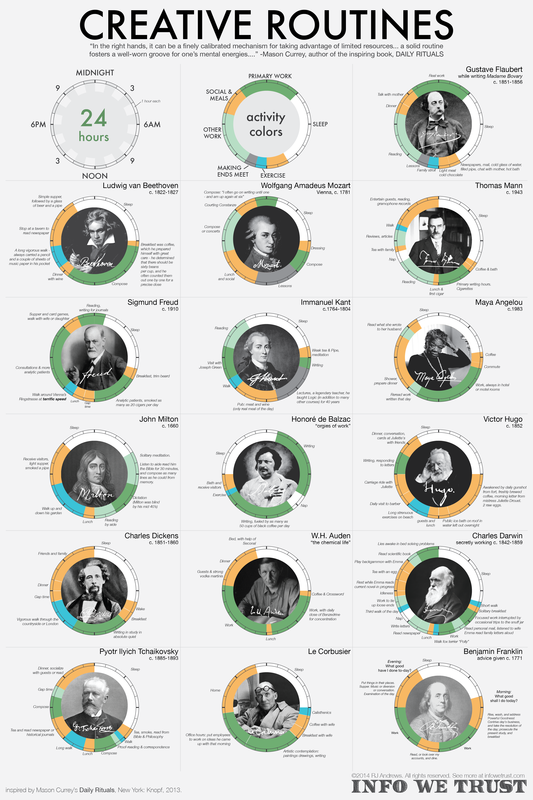 If you don’t, you might consider creating your own 24-hour wheel (as in the inforgraphic) and understand exactly what are your current routines and whether or not they’re helping you be more creative. How much of your day is your own, and how much of it is imposed from someone else? Donald MacKinnon reasoned that most of us lived our lives in the closed mind – where the focus is on getting a task completed, or often many tasks at once, against deadlines which are either given to us or decided by someone else. MacKinnon said the closed mind is good for efficiency and order, but it is still a reactive mind, reacting to our own needs or to someone else’s. A closed mind is not a proactive mind. A proactive mind is an open mind where our mind is open to discovery, curiosity and random thoughts. We are only able to be creative in the open mind. In other words, you need to carve out time in every day – at least 15 minutes, perhaps no longer than hour – to be proactive and open. Do you let your environment influence your creativity? I can’t speak for you, but I can’t do my job from a bed (like Truman Capote) or during a long vigorous walk (Beethoven). And I’m not sure I’d want to. But I also don’t let the environment influence if I’m creative or not. I detest brainstorms in conference rooms as much as I hate white shirts. When I have the choice – which is more often than I assume – I go somewhere else to think or brainstorm. I led a workshop last week where I suggest this same point: have your brainstorms in the coffee shop downstairs. A participant said the office manager (who had left to take a phone call) wouldn’t allow it. When the office manager returned, I asked whether or not he’d care if people brainstormed elsewhere, and to everyone’s shock, he said that was OK, as long as they came back with ideas. In other words, do what you know needs to happen to fuel your creativity, and apologise later. In closing perhaps the best advice I took from Currey’s book was from Stephen King, who said a schedule “exists in order to habituate yourself, to make yourself ready to dream just as you make yourself ready to sleep.” Whether you organise your day into rituals or not, always give yourself the luxury of preparing yourself to think most efficiently, however you you choose to define that routine. What daily creative rituals do you have? What do you do to prepare yourself to be at your most creative? Previous story Can Creativity Be Taught?